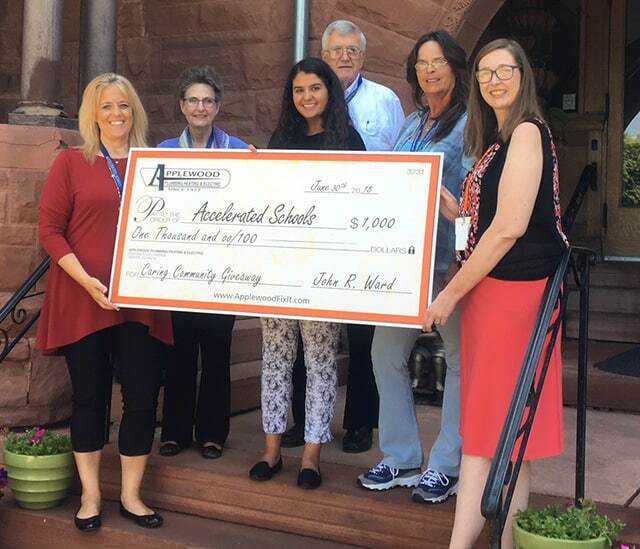 Applewood Plumbing Heating & Electric awarded $1,000 as part of their monthly Caring Community Giveaway to Accelerated Schools, a non-profit based in Denver. For more than 40 years, Accelerated Schools has offered highly accelerated programs for students who are gifted and talented as well as those who may need remedial help. With an average class size of 7 to 1, the students at Accelerated Schools are enrolled into an individualized academic curriculum relevant to their individual needs. This allows students to be prepared for the next level without the need for remediation. “I think it’s great we can help support schools that do so much to help their students achieve their academic goals,” said John Ward, Applewood Plumbing Heating & Electric president. The staff at Accelerated Schools recognizes that the traditional school system is not designed to meet the needs of every child. When a student is not being successful, or is not thriving in a traditional environment, parents must often look elsewhere for a solution. This is where Accelerated Schools comes in. Accelerated Schools offer open enrollment in to their Elementary School, Middle School and High School classes and students may begin classes any day, year-round. The goal at Accelerated Schools is to produce highly skilled students that have a positive attitude toward themselves. Their unique, alternative and rigorous approach to learning prepares the students to be college bound and have the confidence to move to the next level. For more information about Accelerated School visit www.acceleratedschools.org.